Doves vs Feral Pigeons, Birds Of A Feather Or 2nd-Class Citizens? 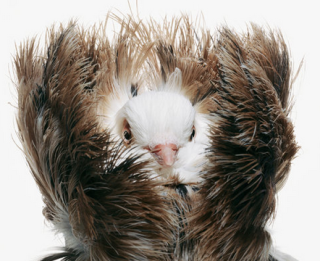 Generally speaking, the terms “dove” and “pigeon” are used interchangeably. And rightfully so, since both birds are members of the same bird clade, Columbidiae, which constitutes approximately 310 species. In the ornithological world, "dove" tends to be used for the smaller of the species and "pigeon" for larger ones. The species most commonly referred to as "pigeon" is the feral rock pigeon, most notably found in densely populated metropolitan areas throughout the world. And therein lies the rub. Having got a bad rap over the years as urban-dwellers and disease-spreading avian creatures, this species is often chastised as pests capable of transmitting diseases, like ‘bird flu.’ Others have gone as far as to label them ‘flying rats.’ Even the celebrated filmmaker, Woody Allen referred to feral pigeons as “rats with wings,” in one of his movies. In actuality, pigeons have had a long history of serving man in several capacities. 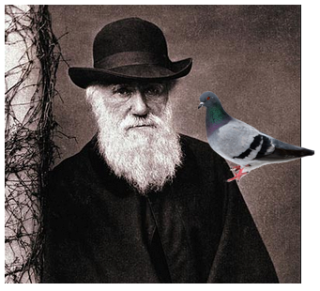 The reliance on pigeons for Charles Darwin food declined when it became clear that chickens were more suited to mass production. However, even when discarding them as a food source, the interest in breeding them remained. In fact, much of the first chapter of The Origin of Species is devoted to pigeons, where the father of evolution theory, Charles Darwin described the many 100s of breeds that have come into existence down through the ages, highlighting their many attributes. While a lot of us grew up hearing stories about the Wild West and the delivery of mail by the Pony Express, less of know about ’homing pigeons’ and how they served as a useful means of transmitting communication as well. Historically on record, dating as far back as 2500 years, by the 5th Century BC, Syria and Persia established widespread networks of message-carrying pigeons. In 1850, Paul Julius Reuter’s fledgling news service used homing pigeons to fly routes throughout Europe up to 120km, laying the foundation for a global news agency, and the world’s first ‘airmail’ stamps issued for the Great Barrier Pigeon-Gram Service. Of note, the pigeons' homing ability was adapted for the two world wars — and in the early 1940s, while the American Signal Pigeon Corps consisted of 3,150 soldiers, it maintained a bird unit of 54,000+ birds. When you think about — they’re among the few birds that the average city-dweller sees on a daily basis. And for those traveling, some of the world’s most scenic cities are home to these birds. London’s Trafalgar Square and Venice’s Piazza San Marco are just two destinations that have long drawn crowds with cameras-on-the-ready to capture the 100s of pigeons that congregate their cities, on any day. So it is difficult to see understand why feral pigeons have become reviled by a contingency of people. Of recent date, in Pennsylvania, animal activists are ironically up-in-arms in an effort to outlaw the repellant practice of pigeon shoots. Steve Hindi, president of SHARK (Showing Animals Respect and Kindness) is at the forefront of those who are behind a bill to condemn this type of senseless killing. SHARK has video-documented these pigeon shoots for years and doggedly publicized the cruelty of the shoots in social media and in hard-hitting television commercials featuring Game Show icon and former host of The Price is Right and Truth or Consequences game shows. “Some die immediately, the lucky ones,” says Bob Barker. In this video, he speaks out vehemently criticizing the practice harshly (note: please be advised, this videos shows inhumane cruelty to pigeons and may be hard to watch for some). Darwin with the last word. . .
For a scientist who spent almost the entirety of his life studying animals, it may seem somewhat incongruous that he favored pigeons over his other pets. But that was the case as he is said to be one of the most famous pigeon fanciers amongst his contemporaries. And IMHO, I have to agree! Frida, Mexico's Canine Heroine, Has Saved 50+ Lives So Far!